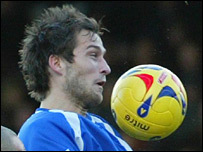 Roger Johnson's late header gave Cardiff City a 2-1 victory against Norwich at Carrow Road. Norwich had taken a 12th minute lead through Simon Lappin who took advantage of Ross Turnball's poor kick. But second-half substitute Peter Whittingham converted Paul Parry's cross to equalise for the Bluebirds. And then late-on Roger Johnson gave Cardiff City all three points sending his header from Whittingham's cross past David Marshall for 2-1. "The fact that we played well before the break is no consolation to me at all. "We should have won the game but instead we let them back into it. "We should have been taking the game to them in the second half but instead we let them take it to us by passing the ball square and backwards. "We kept them in the game by doing that and I call it a lack of professionalism. We have got to learn how to win games, that's our Achilles' heel at the moment." "Sometimes you don't play as well as you can and still take the points. This was one of those occasions. "Peter Grant (the Norwich manager) will feel hard done by right now, and he probably feels like I did after our first two home games this season. "We dominated like they did in our games against Stoke and Coventry without getting any reward. "Today was probably our worst performance of the season and yet we come away with a win. Norwich: Marshall, Otsemobor, Dublin, Doherty, Drury, Chadwick (Huckerby 72), Brellier (Croft 82), Russell, Lappin, Cureton, Brown. Subs Not Used: Gilks, Murray, Martin. Cardiff: Turnbull, Gunter (Blake 46), Loovens, Johnson, Capaldi, Sinclair, Rae, McPhail, Ledley (Parry 46), Fowler (Whittingham 60), Hasselbaink. Subs Not Used: Oakes, MacLean. Goals: Whittingham 64, Johnson 84.